Built in 1560 and taking nearly 100 years to complete, Cusco Cathedral is an emblematic feature of Cusco’s main colonial square – Plaza de Armas. In 1928, Cusco Cathedral was granted Minor Basilica status, and became the official seat of the diocese (under the supervision of a bishop). 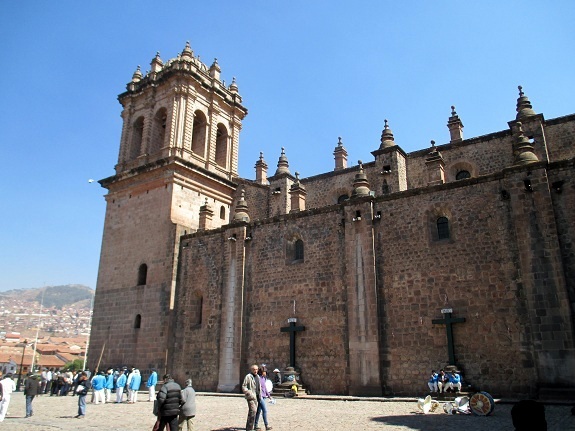 The full name of the Cathedral is “The Cathedral Basilica of the Assumption of the Virgin.” Furthermore, the cathedral was designated a UNESCO World Heritage Site under the City of Cusco listing in 1983. 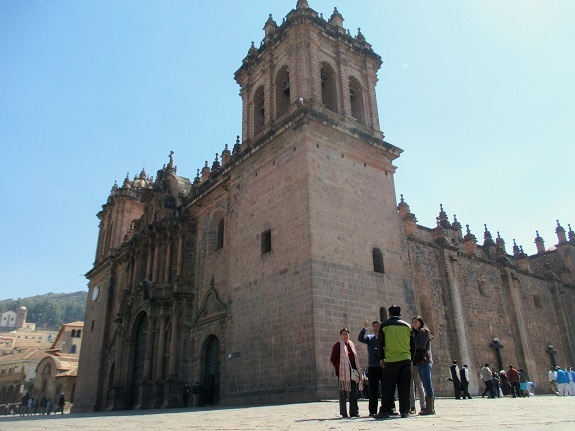 Cusco Cathedral has a rectangular floor design and has 3 large wooden doors on its façade. The structure is made 14 cruciform pillars carved from Andesite stone (hard stone) which support 24 ribbed arched or star shaped ceilings. Many of the stones used in the construction of the outer walls of Cusco Cathedral were taken from the nearby Inca site of Saqsayhuman. The central nave is dominated by the principle altar which is embossed in silver and consecrated to Our Lady of the Assumption. To the rear of the central nave are the beautifully crafted choir stalls, made from pure cedar wood. The cathedral has 14 side chapels which house various artworks, paintings, alters and statues of saints and virgins. The cathedral is flanked by 2 smaller churches: The Sagrada Familia (Sacred Family Church) which is to the left hand-side of the cathedral façade and constructed in 1723; to the right-hand side of the cathedral façade is Triunfo (Church of Triumph), which the Spanish constructed on top of the site of the Inca building – Santurhuasi – after the Inca up-rising and siege in 1536. 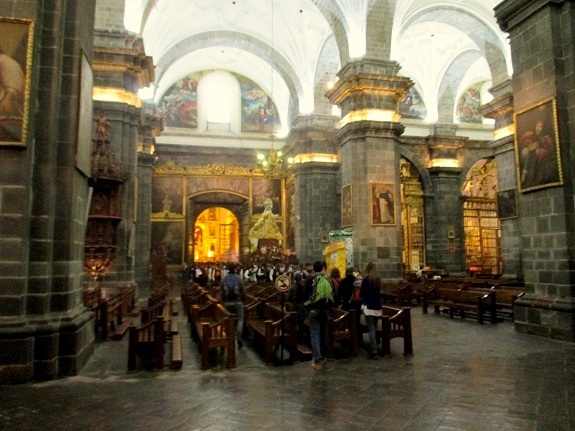 Crypts – Below the main altar in the Basilica is a small crypt that holds the ashes of many of Cusco’s deceased archbishops. An entrance door to the small arched crypt can be found below the right-hand side of the altar. In the Triumph church is the small crypt of Garcilaso de la Vega (1539 – 1616). Born to a Spanish conquistador – Capitan Sebastian Gacilaso de la Vega, and an Inca noble lady – Princessa Inca Isabel Chimpu-Ocllo, Garcilaso de la Vega wrote the famous chronicles “The Royal Commentaries,” which depict the Inca Empire before and around the time of the Spanish conquest of Peru. The crypt holds half of his ashes in a small sliver urn whilst the other half of his ashes are located in Spain where he died. Sala de la Plateria – Meaning “The Silver Room,” this small side chapel holds a rich and varied collection of religious silver artefacts dating back hundreds of years. Among the items is an embossed silver bier used to carry the statue of Señor de los Temblores dating back to 1712. Another impressive item is a large trellis in the form of a small temple. Wooden framed and covered with more than 166 KG’s (370 Lbs.) of Silver, the trellis used during the celebration of Corpus Christi features a silver pelican piercing his own heart with his beak, symbolizing supreme love and abnegation. Painting of the Last Supper – On the wall between Cusco Cathedral and the sacristy, there is an unusual painting of the Last Supper. Measuring approximately 5 x 4 meters (16 x 13 feet) and painted by Cusco Master – Marcos Zapata, the painting has several peculiarities. The strangest of all of them is that the traditional representation of the Paschal Lamb is replaced by a Viszacha, a wild Andean chinchilla (and not a guinea-pig as many think). The Viszacha was the spiritual guardian of the lakes and mountains, according to Andean mythology. Choir Stalls – Located in the lower central nave of Cusco Cathedral, the choir stalls are a must visit. Crafted in the “plateresque” or “neo-archaic” style popular in Spain in the 15 – 17 centuries, the stalls are made from pure cedar. Señor de los Temblores – the black statue of the crucifixion of Jesus is one of the most emblematic symbols of Christianity in Peru. According to ancient legend during its journey from Europe to Peru the ship carrying the statue encountered a horrific storm which threatened to kill everyone on-board. In desperation of imminent death the crew raised the statue into an upright position and the storm miraculously and quickly passed. After the great earthquake of Cusco 1650, the statue became a shrine to the Andean people who placed hundreds of candles beneath the statue in spiritual vigil. It is said that over hundreds of years the smoke from the candles turned the skin of the statue black. 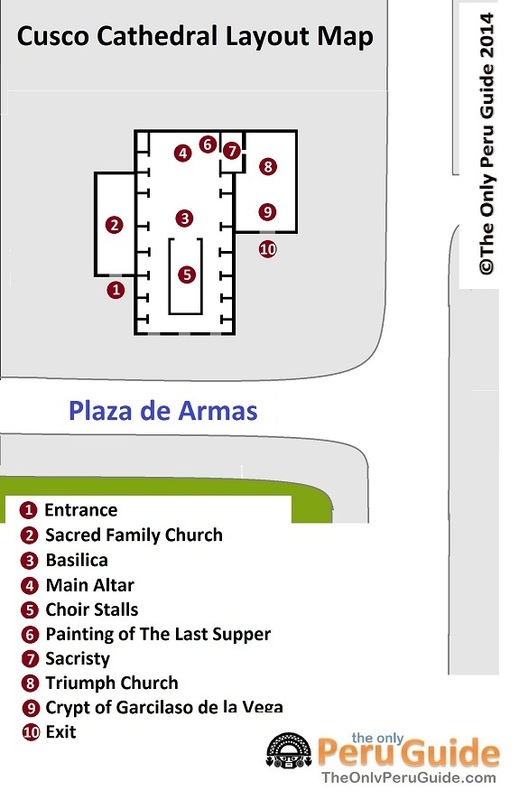 Sacristy – To the right hand-side of the main altar is the sacristy of the Cathedral. Among the traditional robes and vestments used in the cathedral, the walls of the sacristy are dominated by portraits of past bishops of Cusco starting with Vicente de Valverde (life: 1499 – 1541). The sacristy also holds a large retablo entitled “Cristo de la Agonia,” a large cedar wood carving in baroque style with no guiding. Painted by the Cusco Master – Marcos Zapata, the retablo holds 8 paintings which each represent the passages of the life and miracles of Saint Peter. 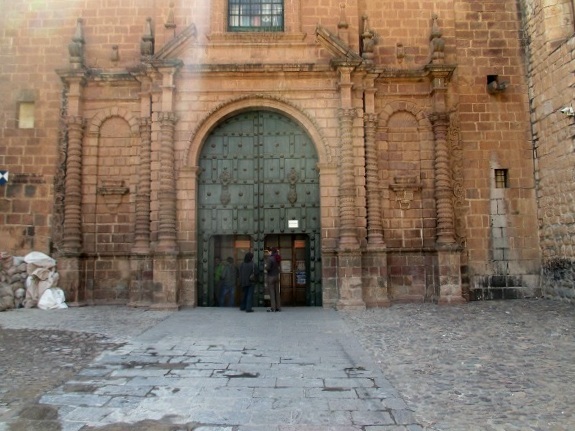 The entrance to the Cathedral is located in the Sacred Family Church, the small church to the left of the cathedral façade. Opening Hours: Monday – Sunday: 10 am – 6 pm.